It's always fun to take a classic cocktail and do a little molecular mixology on it. Here I've taken the basic ingredients of a Cosmopolitan (fresh line juice, cranberry juice, Cointreau (or Triple Sec), citrus vodka) and turned it into a spoonful of happy hour. 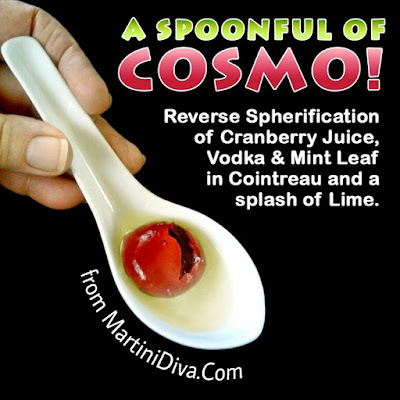 I used the reverse spherification technique on the classic Cosmopolitan ingredients of cranberry juice and citrus vodka then put the Cointreau and lime juice in a little pool in the spoon to float the cocktail sphere in. Note the little mint leaf I added inside the sphere, not a standard Cosmo ingredient but I wanted something floating in the sphere. These cocktail spheres are a perfect pairing with an amuse bouche; one bite, one sip to go with the bite. These also are a fun way to give folks a little happy hour giggle and they won't get you drunk either. Well, not unless you have a dozen or so.